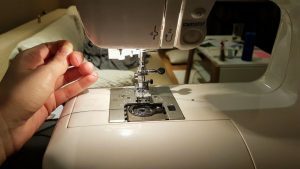 Hello and welcome back to SewingBeginner! How are you doing so far? 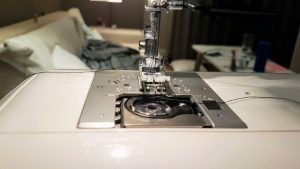 Today, we want to cover one of the most important basics: how to thread your sewing machine. 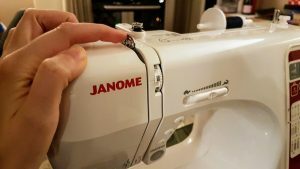 Without this, you can’t make a single stitch😉So, let’s see how I get my Janome ready! The process might seem rather confusing and complex at the beginning but believe me, it will be a simple routine after you’ve done it a few times. Just keep practising! 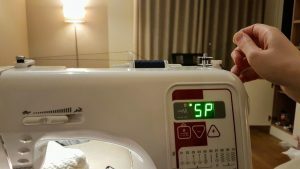 When we are sewing, we always work with two different types of threads: an upper thread that we call the spool and a lower thread that we call the bobbin. 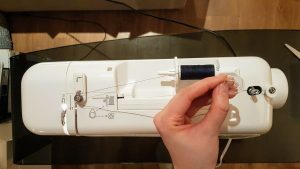 To thread your sewing machine, you need to prepare both threads. 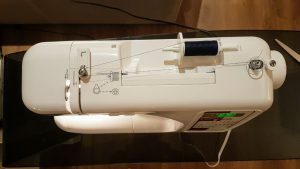 When you purchase a thread, you will usually just get a spool which means that you will need to wind your own bobbin. Or in other words: you need to get some of the thread from your spool (upper thread) onto your empty bobbin (lower thread). Tip💡: I recommend you purchase a set of empty bobbins as part of your basic sewing equipment. You can get them online (e.g. here) or in a sewing store. Place your spool (upper thread) onto the so-called spool pin (see picture below). Use the spool holder (the round attachment piece) to ensure your thread doesn’t slide off. Unwind a bit of thread from the spool and guide it around the so-called bobbin winding tension disk. That’s the little knob on the left side of your spool pin. 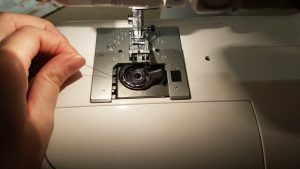 Take your empty bobbin and pass the end of the thread through the tiny top hole of your bobbin. Then wind the thread a few times around the bobbin (clockwise direction). Hold that in place and put the bobbin onto the bobbin winder spindle. That’s the small pin usually on the top right side of your sewing machine. 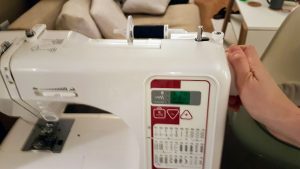 In order to lock the bobbin in place, slide the pin to the right. A special bobbin mark symbol should appear on your display after you’ve done this. 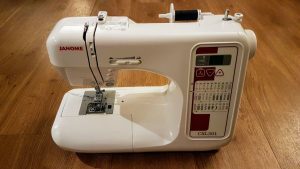 Time to start up your sewing machine! Press down the foot pedal and your machine will start winding. Tip 1💡: hold the thread sticking out of the small bobbin top hole for the first few rounds and then cut it off. Tip 2💡: slide your speed controller to the fastest possible and keep winding with full speed. Most machines stop automatically when the winding is done. 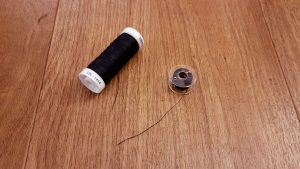 Remove your bobbin from the winder spindle and snip through the thread. Keep in mind to return the bobbin pin by sliding it to the left. Take off the plastic cover from the bobbin holder. To do that, just slide the little switch to the right and the cover opens. 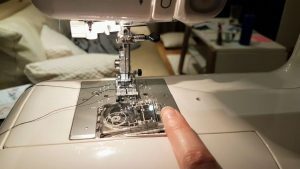 Unwind a few centimetres/inches of the thread from your bobbin. Hold the bobbin and the thread so that it shapes the letter “p” (see picture). Or in other words: when you look at it from above, the thread should be running off counterclockwise. Then place or rather slide the bobbin into the bobbin holder. 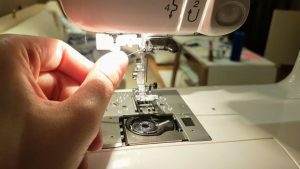 Pull the thread from your bobbin through the front notch of the holder and pull it off to the left. 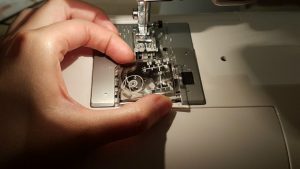 Your thread should then come out from the side notch of the bobbin holder. 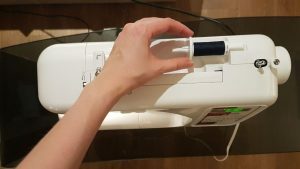 My first piece of advice☝: turn off the power switch of your sewing machine before you start with the threading. Especially as a beginner that’s a good precaution. My second piece of advice☝: while threading your machine, think about making a capital “N” but the other way around, so starting at the end line and moving toward the front line of the letter. 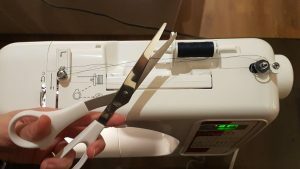 If your sewing machine has arrows for the threading, follow those. Before you start threading, make sure that your take-up lever is standing out. That’s the silver thing which goes up and down when you turn on the hand wheel on the left side of your machine (it’s moving together with the needle). In case you removed your spool, place it back onto the spool pin and attach the spool holder (see step 1). But make sure that your thread is no longer around the winding tension disk that you used to wind the bobbin. Guide the end of your thread around the so-called upper thread guide. That’s just behind the bobbin winding tension disk. Then we start the “N” from the back: go down through the first split in direction needle and guide the thread to the left to go around the check spring holder. Then it goes up from right to left over the take-up lever (the silver thing that’s moving together with your needle). Guide your thread through the eye of that hook before going down through the second split. Guide The Thread Around The Check Spring Holder and Then Up. Above your needle is another hook. Slide your thread behind that needle bar. Then there is one last hook on the left side of your needle. Make sure to slide your thread through that one too. Slide Your Thread Behind The Two Hooks Next to The Needle. 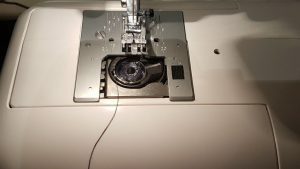 Last but not least, you can finally thread the needle from your sewing machine (from the front to the back). 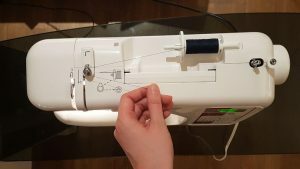 Hold the needle thread (so the upper spool thread) with your left hand. Next, you need to lower and raise the needle to pick up the bobbin thread. To do that, use your right hand to turn on the hand wheel. 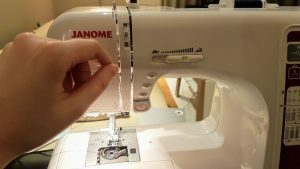 Pull slightly on the thread needle thread that you are holding with your left hand. 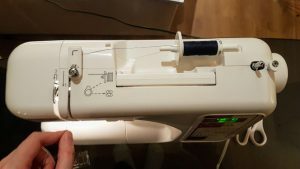 The bobbin thread should be looped into this thread. 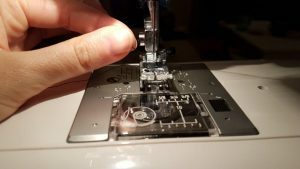 Tip 1💡: use a small scissor or something similar to get the thread away from the foot. 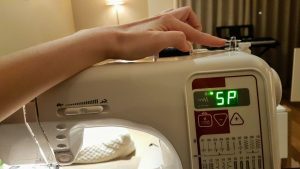 Tip 2💡: there is a slit on the left side of your sewing machine that you can use to cut your two threads to the same length. Last but not least, keep in mind to cover the bobbin holder again with the plastic cover. Just slide it into the hooks on the left side and push it down. Well done, you’ve made it 😃 As mentioned at the beginning, this will be a super easy process after you’ve done it a few time – it just needs a bit of practice.